Your water can pick up lots of undesirable contaminants on the way to your home. Even water that's been filtered in a treatment plant can pick up unwanted contaminants, like pharmaceuticals, parasites, lead, mercury and pesticides, from the pipes it travels through, which can lead to your home. That's why EveryDrop Filters by Whirlpool Water is introducing our advanced ice & water refrigerator filters. EveryDrop is certified to reduce more contaminants - with new Triple Filtration Technology. Filter 7 reduces 7 types of contaminants, helping to ensure the well-being of you and your family when it comes to your water. Remember to replace your refrigerator filter every 6 months to maximize contaminant reduction. 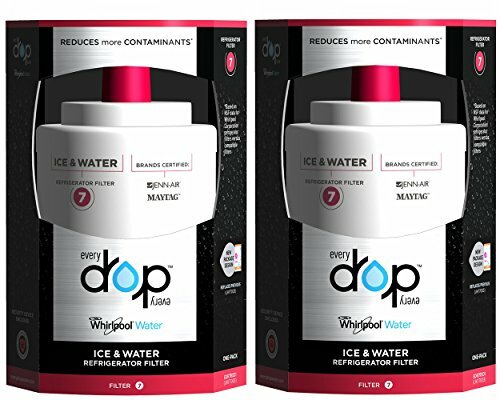 EveryDrop Filter 7 is the only filter Certified by Whirlpool Corporation to work with your Whirlpool, Maytag, KitchenAid, JennAir, and Amana refrigerator. If you have any questions about this product by EveryDrop by Whirlpool, contact us by completing and submitting the form below. If you are looking for a specif part number, please include it with your message.